Buddy will get you Results! I am so happy that I was able to find you and encourage me to hire you as our trainer. It has been a great year! -Loraine S.
Hi! My name is Buddy and I am an In Home Personal Trainer in the Santa Barbara CA area. I have been a certified trainer for almost 10 years now. I moved to California from Florida to pursue my greater interest in the active lifestyle. I’m following my dreams to accomplish my goals of becoming a professional athlete. If anyone knows what it takes to coach you in fitness, why not let it be me? A lot of trainers want to up sell you in their packages and nutrition products. I will never do that! I am here to help you with your needs and only supply with what you ask for. If a recommendation is needed, than I shall give it, but I do not make a profit from it. My goals are yours too and we are working together to make it happen. Lastly, creating a fun and life changing environment for you is the key. This is not a quick fix program. I want to teach you life habits that you can take with you anywhere. Fitness should not be a faze, it should be something you incorporate into you life everyday. I know we both want the best for you and by training with me, we will both hunker down and get the job done together. Consultations are free for compatibility purposes. Questions are always welcome. Let me get you started today on reaching your goals today. Thank you so much for this past year! You really helped me get into that mindset that losing all my weight and getting the body I want is possible. What I really found motivational and inspirational about you is that while you're helping people reach their own goals, you're also working very hard to reach your own. -Rachel R.
Thank you so much for all of your help and motivation! 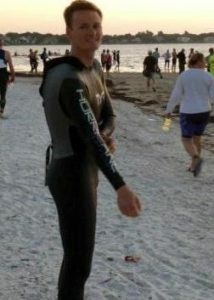 I would have never in a million years been able to complete this triathlon without you! You have really made this process super fun and of course educational! Thank you for pushing me and getting me to complete my first tri with many more to come! -Garima S.
I appreciate that you are always very positive and encouraging, which really helps me to be willing to take the risk and try doing things that I think I can’t do. I also really like that you not only tell me WHAT I should be doing, but you also explain the HOW and the WHY behind it. -Kirsten H.
I can't tell you enough how happy I am to have found and chosen you to be my trainer. Your work is impressive, dependable, flexiable, and honest. I look forward to our sessions knowing that you'll always have just the right challenge. I'm happy with the results so far and would like to set higher goals. Being on the same page about nutrition is just an added bonus. I admire you and wish you the best in your professional and personal life. -Maria C.